Breaking….Mueller does NOT find Trump campaign conspired with the Russian’s…No answer on obstruction…. His first investigative hurdle has been cleared….. While The Special Counsel has charged over 30 people and put some in jail and has outstanding calls for others to come in? Trump get off the hook…. He was NOT the focus of the investigation…. Robert Mueller did not challenge the Justice Department view that a sitting President could be charged with a crime…. While the headlines will scream that Trump gets a pass? Mueller’s people seem to have had a quandary …. 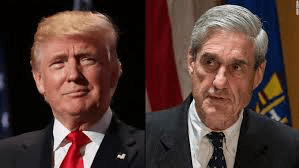 The Special Counsel also says in Attorney General Richard Barr’s summary…..While this report does not conclude that the President committed a crime, it also does not exonerate him’,”….. Some WILL say that President Trump should have been listed as a un-indicted co-conspirator….. It seems THAT was part of the discussions held within the group…..
Rosenstein denies the Presidential immunity issue…. Some of us will NOT buy that…. The media has been pushing that Trump has committed various criminal actions…. Democrats and the Media will now have to stand by as Trump and Republicans do a victory lap on social media and in Fox News channel interviews…. Trump’s approval numbers are bound to get a bump….. While those on the left will clamor louder for impeachment? House Speaker Nancy Pelosi will now be under even more pressure NOT to move to impeachment as Republicans Senator’s now have cover with Mueller’s report to NOT vote to convict Trump of anything serious…. And impeachment move right now would probably serve to assure Trump of a second term in office something even Republicans in Congress would be happy NOT to see…. As in the election in 2016? Donald Trump again dodges a political bullet…. Republicans hunker down and fight….. It has worked twice SO FAR for Trump…. But the numerous other investigations continue in the Special Counsel office, US Attorney’s in NY, Virginia and Washington DC, and with State Attorney General’s in NY, Jersey , North Carolina and other places…. The probes will continue until at least next year…. Who know’s when this will end? A senior Justice Department official said the special counsel has not recommended any further indictments — a revelation that buoyed Trump’s supporters, even as additional Trump-related investigationscontinue in other parts of the Justice Department, in Congress and in New York state. Axios lists the entire letter here…..